The Testo 870-1* was developed for the professional practice of building technicians and installers. It is very good both in qualitative terms and in the breadth of its fields of application. We will provide you with all the details of the device and give you a conclusive review. Testo’s Model “870-1” emerged from a practical development with craftsmen and technicians. 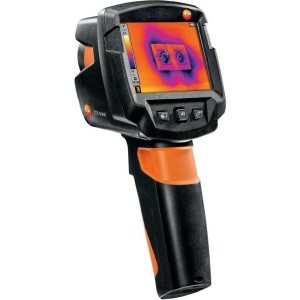 The focus is on a powerful representation of the thermal image, which is sufficient for numerous applications. Many additional functions and elaborate operating possibilities were omitted. As far as the operation is concerned, the Testo 870-1 can really score. Under the display there are 3 buttons, one of which is a button joystick for intuitive navigation. The camera can be triggered at the front of the thermal imaging camera via a trigger button. The left button turns the camera on and off, or stops the current action. By pressing the “joystick” in the middle you reach the menu and can navigate there. The right button can be used with a speed dial function. On the right is a color scale showing the upper and lower limits as well as the current set emissivity coefficient. The thermal representation can be carried out in 4 different color palettes with the Testo 870-1. These include “iron”, “rainbow”, blue-red, and grayscale representation. By default, the temperature can seen in the thermal image. 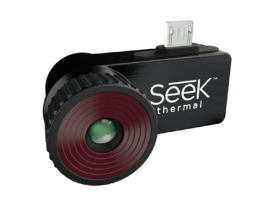 With automatic hot / cold spot detection, the thermal imaging camera immediately finds critical areas in the thermal image. It is ergonomic and robust. The Testo 870-1* is certified to be vibration resistant up to 2 G forces. The case utilizes ABS plastic, which is known for its durability. The integrated Li-Ion battery keeps running for at least 4 hours in normal operation and is charged in the device. Optionally it can also be recharged via an external charger. A charging time of approx. 8 hrs over USB and 5 hrs over the power supply should be considered. The included software IRSoft is compatible with Windows 8, Windows 7, Vista and XP (SP2). Several measuring spots can be conveniently positioned on the PC. The thermal image and the real image (if available) can superimposed with the “TwinPix” visual image. Interesting for service providers are certainly the thermographic report templates including export possibility in PDF format. Professionals can subsequently even correct the emissivity levels in the thermal images with the software and adjust them individually. An ISO certification of the thermal imaging camera is optional and should be taken into account when ordering. The next best model after the Testo 870-1 is the Testo 870-2 with “SuperResolution technology” and 320 x 240 pixel resolution. It also has a camera for the visual spectrum, which allows a “picture fusion” and further increases the meaningfulness. In addition, you get with this thermal camera a practical hard case transport case. The main features of this thermal imaging camera are the 160 x 120 pixel FPA uncooled microbolometer sensor and the focus-free 34 ° x 26 ° lens. The minimum focus distance is at most 0.5 meter (1.64 feet). A spectral range of 7.5 to 14 μm can be detected at an image refresh rate of 9 Hz. Emission correction is adjustable from 0.1 to 1.0. The temperature measuring range is -20 ° C to +280 ° C (-4° F to 536° F) with an accuracy of ± 2% of the measured value. The 3.5 inch LCD with 320 x 240 pixel looks pleasantly large and is fully practical. The thermal images can be stored in the file format .bmt and .jpeg. There is an export function for bmp, jpg, cvs, png, xls. On the internal flash memory with 1.6 GB capacity, more than 2000 images can be stored. The Testo 870-1 is equipped for everyday work. Even with the 160 x 120 pixel resolution, it can be used for various tasks. This includes, for example, the electrical trade. The thermal imaging camera can be used to efficiently test photovoltaic modules and plants for hotspots, failures and other abnormalities. Thanks to the wide lens, the thermal imaging camera is also used in building and renovation technology. Thermal leaks, cold bridges and insulation problems can be detected quickly on the heat images and recorded if necessary. This is of great help in energetic renovation work on buildings. The weak spots of houses can then be quickly repaired, and the improvement work can then be checked again with the thermal imaging camera. Another application area for the Testo 870-1 can be heating construction. It also helps in finding leaks and thermal problems. 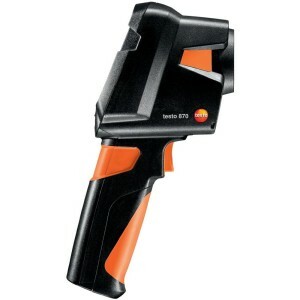 The Testo 870-1 is a decent practical device for building technology, installation technology or the electrical trades. Unfortunately, a visual camera is only found in the Testo 870-2*. The infrared module can also provide sharper thermal images with an upgrade. However, it can be used professionally and easily because of the minimal time needed for the initial training and the simple operation. 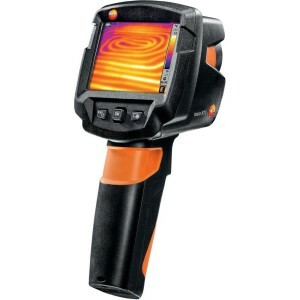 Despite the high price, it is a thermal imaging camera, for which, due to the powerful infrared images and the handling, a purchase recommendation can be pronounced.